"Provides plenty of ease...cotton padding and an orthotic foam...a rubber non-stick backing that will prevent it from sliding around." "Low in price but high in comfort, four sizes, seven colors...bed is “sofa style,” featuring side bolsters your dog can rest his head on." "Features seven inches of therapeutic foam perfect for medium to extra large breeds...“open cell” foam design, which keeps it cool during use." "Orthopedic gel provides pressure point relief and alignment support, while maintaining a cool sleeping surface." "Offers medical-grade orthopedic support and a must-have waterproof surface for when your pup simply can’t get up." "Designed with hip dysplasia and arthritis in mind...firm memory foam to create the perfect pressure point relief for your aging pup." "Provides great orthopedic support with an “egg crate” style foam mattress...ergonomic design provides a thick layer of support." "Human-grade foam and poly-fill bolster make it exceptionally comfortable, even for dogs with joint pain or arthritis." When it comes to buying a comfortable bed for your pooch look no further than this one that provides plenty of ease for both small, medium, and large dogs (well over 100 pounds!) with their medium or large sized beds. The bed has both cotton padding and an orthotic foam that will help decompress your dog's neck and spine as he rests. Besides a supportive place to call home, this bed has a rubber non-stick backing that will prevent it from sliding around on the floor. It is also really easy to remove the cover and machine wash on delicate. For when you just want to spot clean, stains can easily be wiped off and pet hair can easily be removed without much fuss. Many customers agree that this bed is the best from large Dobermans to small Yorkies, from senior dogs to puppies this bed works (and is loved by!) them all. The Furhaven Pet Dog Bed is low in price but high in comfort. It comes in small, medium, large and jumbo sizes, as well as seven different colors. The small measures 20" x 15" x 3.5" while the jumbo size is 44" x 35" x 4.5"—so depending on the breed of your pup, you can find a size that’s comfortable and cozy. This bed is “sofa style,” featuring side bolsters your dog can rest his head on, giving him a sense of warmth and security. Stuffed with certified polyurethane egg crate foam, the Furhaven bed has a fully removable quilted cover for easy cleaning. Reviewers say pups love the Furhaven. They also note that the company has excellent customer service and will replace covers if they rip or pull. Some owners also mention that different colors are slightly different in feel, adding that the blue version, in particular, is heavy and cushier than the others. The Big Barker 7” Pillow Top Orthopedic Dog Bed is the Mercedes-Benz of dog beds. This bed features seven inches of therapeutic foam perfect for medium to extra large breeds. The large size is 48” x 30” x 7” and comes in khaki, gray, chocolate, and burgundy. The Big Barker company also guarantees the bed will keep at least 90% of its shape for up to 10 years. If it flattens at all, a warranty will cover a new bed or foam insert. The bed also features “open cell” foam design, which keeps it cool during use. It’s easy to clean and features a removable 100% microfiber cover that can be popped into the washing machine as needed. Though the Big Barker may be a little too much bed for smaller dogs, it’s a wonderful high-end choice for large breeds, especially those with joint or bone issues. 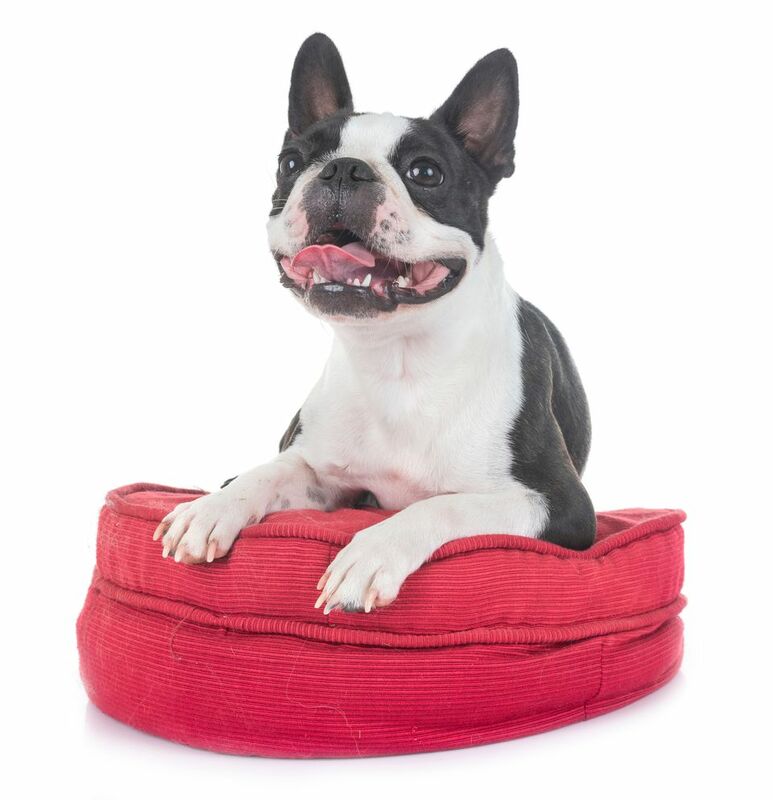 The Dogbed4less Orthopedic Gel Infused Cooling Memory Foam Dog Bed is manufactured with a gel cooling pad to keep your furry friend cool and comfortable, even through the hottest months. It comes in either khaki or brown, as well as seven sizes, so it works for all breeds. The pad itself consists of 2.3 pounds of high-density foam and is four inches thick. One of the best features of this bed is its waterproof liner and two covers, allowing you to easily keep it clean and odor-free. All in all, the orthopedic gel provides pressure point relief and alignment support, while maintaining a cool sleeping surface. When your pup is recovering from surgery, you’ll want to ensure he has the very best sleep, so he can heal and recover. We love The Dog's Balls Premium Orthopedic Waterproof Bed for post-surgery snoozes because it offers medical-grade orthopedic support and a must-have waterproof surface for when your pup simply can’t get up. The bed measures 40” x 25” x 6” and comes in seven different color options. The waterproof liner is machine washable and mold-proof, and can be replaced if necessary. If your pup undergoes surgery, a firm, orthopedic bed is an essential purchase to help get him back on his feet. Many dogs face the same health problems as humans as they age, especially when it comes to sore, arthritic bones. The OnePet-TwoPet Orthopedic Dog Bed is designed with hip dysplasia and arthritis in mind, and features five inches of firm memory foam and an inch of soft foam to create the perfect pressure point relief for your aging pup. It has a non-slip bottom, so your dog won’t fall when getting out of bed, and also includes two machine washable covers. It measures 44” x 35” x 6”, and comes in either tan or brown colors. Additionally, if you’re worried about whether your pup will take to a new bed, this company offers a 100% money-back guarantee for up to 90 days. For humans and dogs alike, there’s nothing worse than trying to get comfortable on a bed that’s too small for your body. That’s why it’s important to make sure your dog bed’s measurements are appropriate for the size of your breed. The Milliard Quilted Padded Orthopedic Dog Bed is available in two large sizes—24” x 27” and 47” x 29”—and provides great orthopedic support with an “egg crate” style foam mattress. The largest version fits neatly into a 48” dog crate, so you can create a comfy hideaway for your pup or simply use it on its own. Most importantly, the ergonomic design provides a thick layer of support that provides relief from common large-dog conditions, like hip dysplasia. Customers say the Milliard dog bed is highly durable, adding that the egg crate design results in an extra-comfortable mattress. They also call out the non-slip material used on the underside, which ensures the bed stays put even when their big breeds flop down for a snooze. Looking for an orthopedic bed with a scale that matches your pint-sized pup? This one from Friends Forever measures 20” x 25” x 5”, so your best friend will have plenty of room to sprawl out—it’s suited to dogs weighing up to 30 pounds—but won’t find themselves lost on a giant mattress better suited to a large breed. The human-grade foam and poly-fill bolster make it exceptionally comfortable, even for dogs with joint pain or arthritis. The bed itself is chew-proof, and it also includes a machine-washable cover. Customers call this dog bed from Friends Forever the best they’ve ever purchased, noting that it holds up exceptionally well and provides great support for older dogs.